Morocco is famous for many things, one of which is their varied assortment of clays. They come in different colors and are used mainly to treat and pamper the hair and skin. Two of these are Rhassoul and Red Clay. These have gotten famous in the past few years, but the truth is that they have been used for more than 1200 years. Let’s find out more about these Moroccan clays. Before we talk about what makes these clays distinctly beneficial, let’s take a look at their similarities. Now, let’s see how Rhassoul Clay (also called Ghassoul) and Red Clay are distinct from each other – this way you’ll see which one is perfect for your skin. Rhassoul clay contains minerals like silica, sodium, calcium, potassium, and magnesium. These work in replenishing depleted minerals in the skin, so that you get a more even, plum, and firm complexion. It is best for greasy, oily skin. Studies show that it helps improve skin elasticity, remove excess oils and dead skin cells, as well as unclog pores. It does not stain clothing or skin and can create a bit of mess at best, depending on how much you use at a time. Red Clay contains Dolomite, Silica, Ferric Oxide which make it absorbent. It is has proven to be great for cleansing skin. It is perfect for mature or dry flaky skin because it improves the elasticity and texture of the skin. It has a red color because of the high iron oxide content. It revitalizes the brightness of the skin. It can help treat skin conditions like sunburns, psoriasis, eczema, and rosacea. It can stain clothing or skin, that’s why it’s not recommended for blonde or light-colored hair. 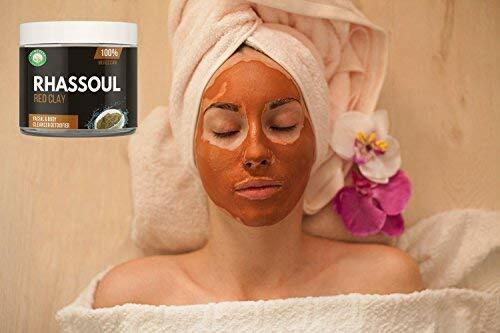 Rhassoul clay contains a mildly abrasive consistency which is effective in scrubbing dead cells off the skin, leaving you with a soft and smooth feeling. 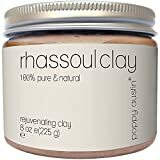 As a soap, rhassoul clay is very effective in cleansing clogged pores. The dirt, pollution, and grime is sucked out of the pores, leaving you with purified skin. The main reason why many use rhassoul clay is its efficiency in soaking up surface oils stuck deeply in your pores. With no excess sebum or oil, you prevent pimple, comedone, and blackhead formation. Rhassoul clay is also helpful in softening rough and tough skin, such as on knees and elbows, as well as cracked heels. Rhassoul clay can tighten large pores, shrinking them down, thanks to its natural astringent properties. 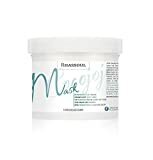 Rhassoul natural clay mask is rich in magnesium, silica, potassium, and calcium, which all help to nourish your skin. 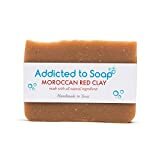 This Moroccan clay draws dirt, sebum, wastes, and toxin out of the skin so that they stop clogging up. This is because of their detoxifying properties, due to the high levels of ion exchange. It makes a great mask or exfoliating cleanser with an exfoliant added to it. Rhassoul clay is versatile and a great additive to make your own beauty products. You can use this clay for skin irritations like psoriasis and eczema. It helps mellow down inflammation in the skin. That’s why it’s often used as soothing masks for instant relief. You can expect a buttery soft, smooth and toned skin complexion, free from dryness, blemishes, blackheads and blocked pores; Your hair will feel light, manageable and conditioned, with curls defined and frizz controlled. Red clay is very delicate and can be used on sensitive skin types. It helps regulate excess fat, which makes it beneficial for the healing of acne, blackheads, and pimples. Those who form these skin problems due to excessive sweating can also benefit from red clay. These products do not contain any harmful chemicals such as parabens, phthalates, and petrochemicals that cheaper alternatives use that can irritate and damage your skin. This Moroccan clay helps cleanse the skin and promotes healthy cell regeneration. That’s why it’s a great body scrub and skin cleanser. Red clay masks work really well for cellulite formations and stretch marks. It’s a solution for oily hair, too, because of its ability to regulate excess oil in the hair roots. This soap is scented with Caribbean Coconut smells like fresh roasted coconut. Men and women love this scent. Red clay is a natural ingredient that helps stimulate blood circulation. As a result, more oxygen is made available to muscles and tissues, relieving pain from injuries. Take note to use it only for non-congested areas, though, where no active inflammation is present. This Moroccan clay acts as an astringent, too. If you have scar formation, it can help stimulate healing. The impurities are drained out. Because red clay is highly absorbable, toxins can be quickly neutralized. This clay draws oils from the skin which makes it a fantastic astringent for oily hair and skin. Furthermore, it stimulates skin circulation and because of its gentleness, it is suitable for even the most sensitive skin. Red clay is effective in relieving inflammation and the pain that comes with it, such as for varicose veins and osteoarthritis. It is effective to apply on cramps or sore muscles. If you are having skin problems, it’s time to try out these Moroccan clay options. They are great for sensitive skin types, too, as well as hair problems. Morocco is known for its natural soaps as well: Moroccan Black Soap, Red Clay, and Argan Oil Soap. You can check them out in this post. Or check out our article about the rich history and best brands of French soaps today.